Dr. Henry Siu, delivering a lecture to an economics class at UBC. 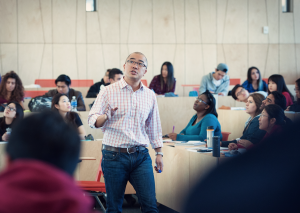 Dr. Henry Siu, Associate Professor of economics at VSE, will be participating, by invitation of the US White House, in a major public symposium to address the near-term impacts of artificial intelligence (AI) technologies across social and economic systems. The focus of the discussion will be the challenges of the next 5-10 years, specifically addressing four themes: social inequality, labor, healthcare, and ethics. Dr. Siu will join leaders from industry, academia, and civil society in sharing ideas for technical design, research and policy directions. In addition to his work at the VSE, Dr. Siu is a Faculty Research Fellow at the National Bureau of Economic Research. A macroeconomist, his research focuses on business cycles and the consequences of macroeconomic forces on the labour market. Henry has spent time as a visiting researcher at the Federal Reserve Banks of Chicago, Minneapolis, and St. Louis, the Reserve Bank of Australia, and the Bank of Canada. He was the inaugural recipient of the Bank of Canada Governor’s Award in recognition of his contribution to macroeconomic research. His research is referenced widely by media, including recently in the Wall Street Journal and on Huffington Post. This event will be live-streamed free (click here for event website to view the live stream). Please note the start time of 5:30pm is local time to New York City.